Ex-cop pimp Jung-ho is irritated because his girls keep disappearing without clearing their debts. One night, he gets a call from a customer and sends Mi-jin. Jung-ho realizes the phone number of the customer matches that of the calls the missing girls got last. As something smells fishy, he searches for her. During his search, Jung-ho dents a car in the alley. 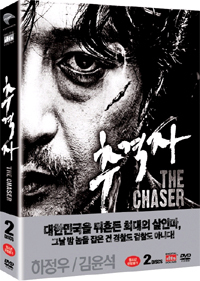 When Jung-ho spots blood splattered on the driver�s shirt, he senses the man, Young-min, is the suspect. After an intense chase, Jung-ho catches Young-min. But because of Jung-ho�s pretense as a cop, they are both taken to the police station. At the station, the man bluntly confesses he has killed the missing women, and the last girl, Mi-jin, may still be alive. As the whole police force is obsessed with a random search for corpses, Jung-ho is the only one who believes Mi-jin is still alive. With only 12 hours left to detain the serial killer without a warrant, Jung-ho�s hunt begins, searching for Mi-jin entrapped in a place nobody knows.